Be aware! 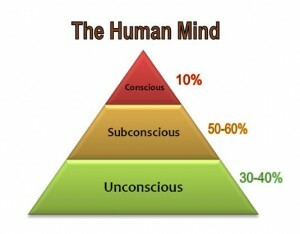 Keep your conscious mind present. Do not allow your subconscious to run the show. Notice, consistently, what goes on in between your ears and accept complete responsibility for it. The conscious part of the mind is likened to a Captain on a ship giving out orders, but the crew (subconscious & unconscious) is behind the scenes doing all the work. The subconscious is in charge of the most recent memories while the unconscious mind houses the warehouse of a lifetime of memories, experiences, beliefs, behaviors and habits. The conscious mind has the ability to direct your focus and to imagine possibilities, which the subconscious and unconscious cannot do because they are wired to form logical patterns of association based on your history. The conscious mind feeds information to the subconscious, so if all you feed the subconscious is negativity, the subconscious will reinforce those thoughts with past experiences that were negative to support the conscious mind’s thoughts. The ability to control and choose your thoughts at a conscious level is perhaps one of the most important powers we possess to create change. The article mentions one of my favorite authors – Viktor Frankl, a psychiatrist and a Holocaust survivor. In his book, Man’s Search for Meaning, Frankl relates the story of prisoner of War who “thought” his way out of the hole the Viet Cong held him in for years. Each day, the POW imagined his daily “normal life” routine, including waking up to an alarm, having coffee, going to play some golf, etc. After he was released from the POW camp and regained a modicum of health, he went to play a real game of golf. His score was better than before he’d gone to war. A true testament to the power of thought and visualization and how we choose to respond to our experiences in life. Since the subconscious cannot determine what is a “real” versus an “imagined” experience, the conscious mind is in control of the programming, and therefore, in charge of the storage of feelings, habits, and emotions that can be recalled. It takes THOUGHT and HABIT of MIND to re-program the stored memories because the current default memories are on “instant recall”, but it is possible to re-direct and deflect that memory history. Many of these same feelings, habits, and emotions also lie deeply buried in the unconscious mind. Just as how habits and thoughts became a part of the subconscious/unconscious mind, those same thoughts can be over-written with new and healthy feelings, thoughts, and emotions by beginning with the conscious mind and making a dedicated habit to choosing carefully the thoughts and behaviors that move you forward into the life you want. . . or rather, the life you imagine! Constant and consistent meditation helps to clear out some of the stored thoughts and emotions, which, in turn, clears a pathway for the conscious mind to provide more positive thoughts and energy. I am in the right place, doing the right thing, at the right time! I can solve any challenges that come up today! I have the knowledge to make smart decisions for myself! I am feeling healthy and strong! I make right choices for my health and wellness! Currently, my subconscious has been in charge, and I have relied on past behaviors to “get through” whatever I’m facing. I have allowed the excuse of “too tired”, “too busy”, “too whatever” to justify my behavior instead of being fully accountable for my choices/actions. Where has that gotten me. . . in a state of declining health and increased weight which then starts the negative spiral in my head of “I am not worthy. . .”. Re-directing those negative thoughts and replacing it with positive affirmations along with daily meditation is one more step toward health. Perhaps it was you, Sheri, who said something to the effect that you are always going away from and toward something. I choose to go toward health and away from un-health.